Last week, #langchat was a flurry of activity! Langchatters discussed useful games for vocabulary practice, interactive communication practice, writing skills, and review, while also sharing other favorites. Participants were left dazed and confused, exclaiming, “My #langchat head is spinning!,” (@ShaneBraverman), “I’m gonna need more RAM just for all my #langchat tabs!” (IndwellingLang), and “I’m getting vertigo!! So much great information!” (@Narralakes). Even our seasoned moderators struggled to keep up. @KrisClimer wrote, “My Tweetdeck feed is moving so fast with good #langchat ideas, I can NOT favorite before they’ve disappeared!!!! #LuckyProblem.” Thank you to everyone who contributed to a truly rapid-fire #langchat! We would also like to thank our moderators, Colleen (@CoLeeSensei), Kris (@KrisClimer), Sara-Elizabeth (@SECottrell), and Laura (@SraSpanglish), for leading the chat. Question 1: What games do you use for vocabulary practice? Participants’ suggestions for vocabulary games focused on activities that get students moving and circumlocuting! Name that word! Definitions in the target language: @RLavrencic has students define new vocabulary words in the target language for homework. The next day, they read their definitions, and the class guesses the word. Additionally, participants mentioned applications that can be used for vocabulary review. @Narralakes summarized the main suggestions: “Socrative, Quizlet, [and] Kahoot.” Memrise is also a great tool for independent vocabulary learning. Question 2: What games do you use for interactive communication practice? 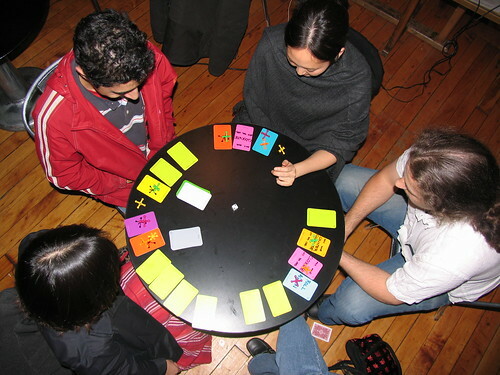 Participants suggested a range of games that require students to ask one another questions. Scavenger Hunts: Participants suggested scavenger hunts as a fun source of interactive communication practice. @ShaneBraverman said that students could be prompted to “Find somebody who…” Alternatively, @Narralakes noted that instructors could “use QR codes and get students into teams and create a mystery game around [the] school using.” @CoLeeSensei replied that it’s “[even] better [when] using ‘verbal QR’ codes – [Students] listen to a clue to follow.” She shared a link to make audio codes: http://t.co/dGnLYqMZpe. Question 3: What games do you use to target writing skills? Langchatters had lots of ideas about how to turn writing practice into fun and engaging games! Collective storytelling: Participants shared a variety of ways for students to collaboratively write stories. @CatherineKY72 offered one suggestion: “[Students] have 5 [to] 10 [minutes] to come up [with a] story. [The class] votes on [the] best/funniest/darkest.” @MmeLohse provided another option: “[It’s not] exactly a game, but [students] write a ‘shared’ story, alternating back [and] forth with every line. [They are usually] very funny [and] creative.” Finally, @crwmsteach suggested that instructors provide students with the last sentence of a story and have teams write a story. Apples to Apples, Bananagrams… @lovemysummer wrote that instructors could use these ready-made games in the classroom for fun writing practice. Throughout, instructors frequently recommended using small white boards in games focusing on writing practice, noting their popularity among students. Question 4: What games do you use for review? Question 5: What are your OTHER favorite games and what skills do they help? As an action-packed hour came to a close, Langchatters shared their favorite games. #Langchat participants has PLENTY of ideas about how to use games in the classroom for different purposes. @CoLeeSensei wrote, “Can I just cite the entire hour of #langchat as my takeaway??? ?” In case you are in search of even more ideas, @SECottrell shared links to previous #langchat posts on gaming in the classroom: http://t.co/4JyBtKiOHx and http://t.co/xSZR0HfeHa. Thank you to all of our participants for helping #langchat thrive and continue to be such an invaluable resource! You can find us on Twitter every Thursday night for the weekly chat. *Reminder*: In case you can’t join us at that time, now you can also #langchat on Saturday at 10 a.m. ET – Same questions, more chat time!